Paul McGann (the Eighth Doctor), Nicola Walker (Liv Chenka), Hattie Morahan (Helen Sinclair) and Alex Kingston (“Melody Malone”) lead a gargantuan cast across four blockbuster adventures, including the return of Mark Bonnar (the Eleven), Emma Cunliffe (the Sonomancer) and Robert Bathurst (Padrac), along with the Doom Coalition debut of Rufus Hound (the Meddling Monk)! Picking up from the shocking cliffhanger that ended the previous box set, the Doctor must start from nothing if there is any hope of averting genocide on a cosmic scale. 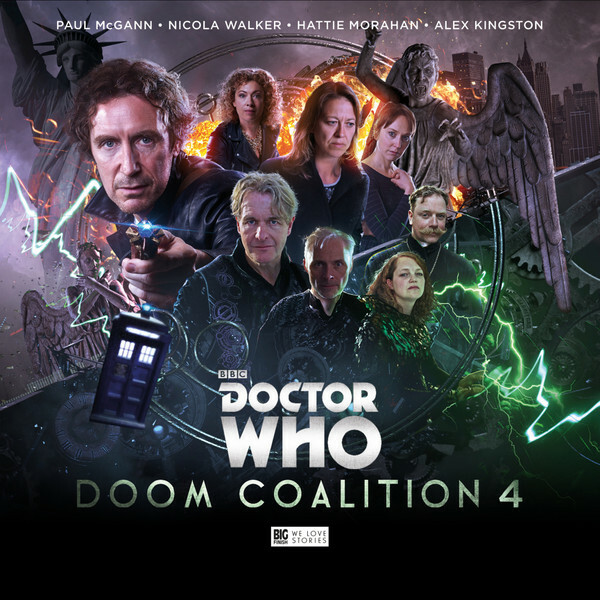 Melody Malone may be the Doctor’s only hope, but she’s just been made a better offer... A lot of build up has gone into the Doom Coalition series, establishing a number of settings and characters to set the stage for this, the payoff. With three companions, a consortium of renegade Time Lords and the Weeping Angels all in play, this 5 CD box set has had everything and the kitchen sink thrown in to make a spectacular finale.